Kat's 9 Lives: Pescadou Bistro : Happy Bastille Day! Taking a short break from Vegas to post about today's dinner to warn people. Happy Bastille Day to All! ^_^ If only we were all in Paris to see the beautiful celebration at the Eiffel Tower! 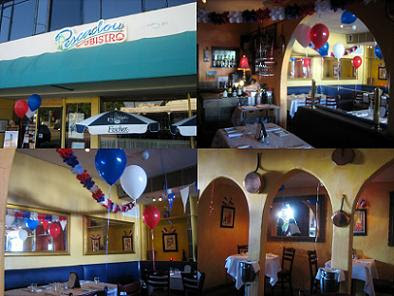 I happened to come across rave reviews for Pescadou Bistro in Newport Beach and they have a special Tour de France menu with an extra special Bastille Day Pre-Fixe. Since today's a celebration they have a pre-fixe for $45 per person and the rest of the Tour de France is a $39 per person pre-fixe. The food looked decent and the reviews were so wonderful that I told Tofu about it and he wanted to try it. He just returned from the Bay Area earlier today and we drove out for a nice dinner. UNFORTUNATELY, it was a HUGE let down! We started the night out with some Apperitifs because I was in a good mood and wanted to have a nice dinner with great food. Sadly... No. I ordered the Bellini, which was Sparkling Wine and Peach Nectar. Tofu ordered the Boissiere, which was Sweet Vermouth. They were both sweet. Mine was light on the palette and you could barely taste the alcohol, which is the way I like it. Tofu's was very sweet and more alcoholy, but still good. The "amuse bouche" for the night was Assiette de Charcuterie. 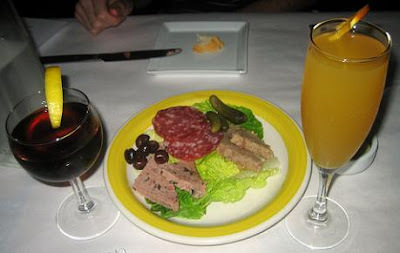 It's Country Style Pate, Duck "Rillettes" & "Saucisson", served with Cornichons and Nicoises Olives. They bring out a small plate that made me nostalgic to Paris. I think this was the first time that Tofu had liver and they did a decent enough job that he ate it. The flavors were good and the textures were nice. I didn't really like the bread they brought out though, because it lacked the crisp & delectable texture of French bread. It was very difficult to butter the bread. If the bread is not robust enough to withstand buttering, then you should serve butter at room temperature so that it can glide across. For our starter, we both chose the Soupe a L'Oignon Gratinee. It's Onion Soup garnished with Croutons and melted Gruyere Cheese. If you know me, I LOVE my cheese! So when I ordered this I asked for extra cheese and they said, "Sure no problem!" They were very friendly here, but that can NOT make up for the food. The soup was decent. It's definitely not the best and not the worst I have had. The flavor was a little too light for me. I overheard the owner talk to a customer and commented that they used more chicken in the soup than beef. Once they said that I realized why it wasn't flavorful enough. The cheese was disappointing because it lacked any Gruyere flavor that I love so much! Based on the above, I wouldn't recommend the soup. Everything just started going down from there! For my main course, I decided to try the Cotes d'Agneau Grillees Aux Herbes. It's Grilled Lamb Chops with Provencale Roasted Tomato and Pommes Frites. At first I was very impressed to see that they had lamb on the pre-fixe so I knew exactly what dish I wanted. I mean how can you go wrong with lamb? Well thy probed me WRONG! When lamb is bad it's REALLY BAD! First, I asked for it Medium-Rare to Rare and it came out almost Medium-Well Done. This made the texture extremely rough and it did not help that the meat was flavorless! All you could taste was the bitter grill. I was sorely disappointed and was VERY tempted to send it back, but then I thought they are so nice and that would be mean. Tofu should have slapped some sense into me to send it back! I even lied to them when they asked how was everything, I said it was good. I have sinned! Albeit, my palette is way experienced for someone my age. Still, I can appreciate good food or average food. So to check my reviews and thoughts, I asked Tofu what he thought. He even admitted that his palette is not as complex and he thought the lamb was HORRIBLE. I seriously didn't even eat any ofthe main course! I was hoping that the french fries would be good and I can survive on that... but NO... it was way over-fried and lacked any flavor. Sigh! This just ruined my whole night and it was NOT a cheap meal... >_<### Luckily Tofu decided on another dish. At first he was debating between the lamb and the Boeuf Bourguignon. It's Braised Beef in Red Wine with Aromatic Vegetables, White Mushrooms, Carrots, Pearl Onions, and Potatoes. Tofu has made this dish before and I was there to see the whole show. I tried a little bit and it was not bad, but I agree with Tofu that it's almost like the one he made. It was decent but nothing to blow you away. He said he wanted to try this dish to see what a traditional French preparation would be like. I commented later to him that this is NOT the place to compare and he agreed. The flavor was strong but not too over-powering and the sauce was thick. For dessert the server adamantly suggested that we get the Crème Brûlée. It was actually pretty good, especially compared to everything else! The texture was soft and delicate yet flavorful. There definitely was a strong egg crème flavor. The crystallized sugar was very good and really complimented the whole thing. I would definitely get this again. 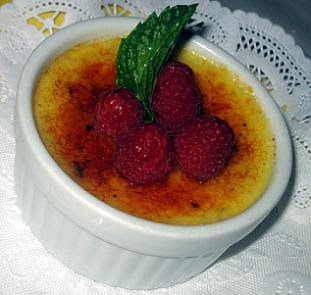 It's not the best crème brûlée I've ever had but pretty solid. All in all the food was EXTREMELY DISAPPOINTING. The service was very friendly and homey. Our meal ended up being about $70 per person with everything and we definitely did not enjoy it. I was thinking about going to McDonald's later and get something that actually tastes good and is fulfilling! The owners were there and they seem French, but don't they know what good French food tastes like??? I am sorry if I sound snobby, but I went to the top restaurants in Paris and it surely did NOT taste like this. Even the small whole in the walls or local places did not mess up like this. Before going there today I was already thinking about going every week to try their Tour de France pre-fixe, but now... HECK NO! You do have very sophisticated (expensive?) taste for your age, although this place sure sounds disappointing. Not all French places are born equal! When it is good though, it is definitely amazing. P.S. You seem to be having a lot of tough meat lately. I would recommend sending it back - a good restaurant should be more interested in making sure you have a great meal (and become a happy return customer) than worry about a dish being sent back...just IMHO. "...but usually the food that tastes good happens to be expensive." Ha ha ha, famous words of Kat!!! 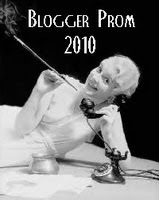 OMG, I can keep up with all these blogging and commenting! Give me some time to catch up! And Bumblebee don't make any accusations that I don't have time to read. Where is Ms. Lin?! Ms. Lin doesn't read my blog that often, she's glued to her TiVo! lol She only comes on when I tell her you guys commented and she will comment back for fun. =P Any plans for the weekend HoneyBee? If you want, Ms. Lin will be in SD soon and I will join her if you want ot come on a food adventure too! Sorry BumbleBee! You're always welcome to drive down! Oh yes, please let me know when you go on your food adventures with Ms. Lin, BUT Bumblebee will NOT be happy!!! Oh well. No food adventures for me this weekend, and next weekend I'm in Phoenix in 110 degrees!!! Kind of like you in Vegas this week. Send me an email with your itinerary in an Excel sheet, pleeeese! 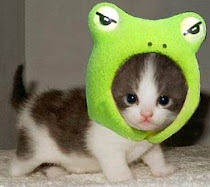 It's s(mylastname)75 at yahoo. I stopped reading because I just couldn't keep up with all the comments - I'd have to be on all the time! :-P Anyway, I think it's unfair to compare this place to top restaurants in Paris. We also had some not-so-great and expensive meals in Paris (and rest of Europe). It's all part of the adventure and it is a gamble! But Kat, I'm glad you are trying out places in OC so I don't have to waste my time (and money) eating mediocre food! ^_^ I'll see you in San Diego!